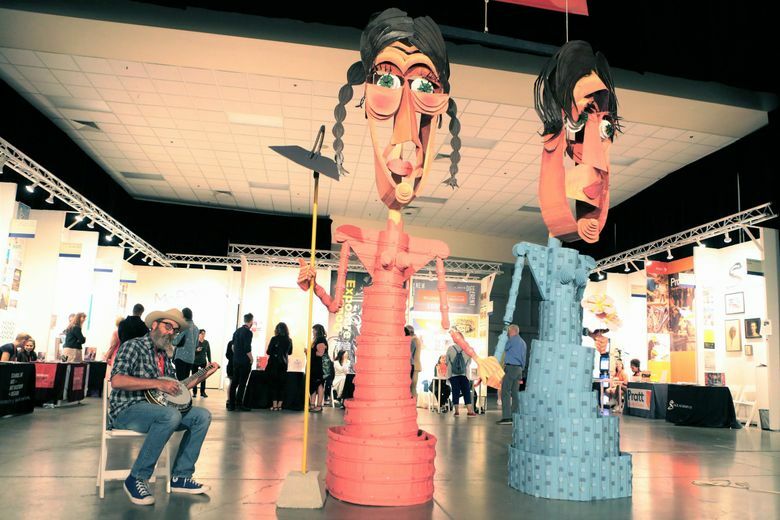 Mary Ann and Louisa Boren — two 14-foot cardboard puppets created by the artist Wayne White for the Seattle Art Fair — have been donated to the school as a dual art and Seattle-history lesson. Students returning to Montlake Elementary School will have a pair of very tall, very colorful sisters joining their ranks this fall. Mary Ann and Louisa Boren — two 14-foot cardboard puppets created by the artist Wayne White for the Seattle Art Fair — have been donated to the school, where one sister will be placed in each of the school’s two stairwells, a whimsical lesson in local history, writ large. “I think it’s perfect,” said White, now back home in Los Angeles. “It is kind of a portal for history for kids. And it sounded good. An old school with cool interiors. Maybe it will spark something else because it’s pleasurable. Inspiration comes in all kinds of packages. It’s not quite what White imagined when he created the piece for the Seattle Art Fair in a South Seattle studio with the help of a merry band of cutters, hot-glue gunners and painters led by local Cary Kemp. White was hoping to sell the sisters to a collector, or maybe even the city of Seattle, which the Borens helped found in 1851. Visitors to City Hall could pull the attached rope that makes them bob up and down. Something to help ease the stress of a parking ticket or, you know, being mayor. When no buyer appeared by last Saturday afternoon, fair producer Max Fishco put out the call for a taker. Local artist and entrepreneur Greg Lundgren volunteered his unsuspecting sister, Jennifer, an “all-star art teacher” at Montlake. When Lundgren called his sister to tell her what he’d done, she didn’t hesitate: “Heck, yeah!” She had seen White’s sets and puppets on the subversive children’s show, “Pee-Wee’s Playhouse,” and in “Beauty is Embarrassing,” the 2012 documentary about White. White’s silly-yet-substantive creation seems the perfect fit at Montlake, where Lundgren leads the Montlake Experimental Secret Art Society (MESAS, for short), a “guerrilla art group” of fourth- and fifth-graders. They have done things like stuff parking-ticket envelopes with handmade tickets for offenses like “awesomeness” and left them under the windshield wipers of their parents’ cars, and in the neighborhood around the school. They also put on a fashion show in the school cafeteria using clothing out of the school’s Lost & Found. That study should include a review of White’s price list so that the kids — and parents, and school district officials — fully appreciate what they’re getting. Years ago, White created another set of cardboard, puppet siblings, The Louvin Brothers, based on the country-and-gospel duet. A private buyer paid $50,000 for the piece, then put the brothers in storage for a while before donating them to the Country Music Hall of Fame. Not only are the sisters a true art piece, they are true Seattle history — a quality that White seeks out in his subjects. “I didn’t want to do the obvious stuff: grunge, the Space Needle. It’s a little too cliché,” White said before he arrived here for the fair. “I like their story,” he said. He liked that Louisa kept their boat from going over the Cascade Falls when the men in charge got drunk or fell asleep; and that she brought with her the sweetbrier rose that now grows all over Seattle. And he liked that Mary Ann and Louisa’s husbands — Arthur and David Denny — were brothers. “The Boren Sisters are just one example of Wayne using the local history,” said Karyn Behnke of the Joshua Linder Gallery, which represents White. “It has to re-exist in the local context so that it maintains its presence and punch. It’s the best place to combine the education process and the history. Lundgren thinks the sisters landed in just the right place — just as they did 167 years ago, when they stepped onto Alki Point.